Wed., Aug. 30, 2017, 9:12 a.m.
Alcohol sales to general ticket holders at Cougar football games will wait until at least next season while Washington State University officials re-examine the proposed move. 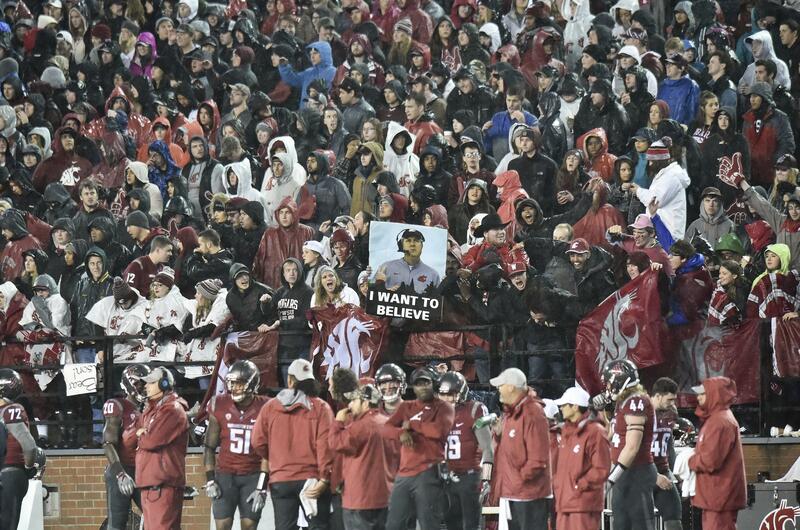 A year ago, the school was waiting on a decision from the Washington State Liquor and Cannabis Board about expanding liquor sales throughout Martin Stadium’s non-student section. President Kirk Schulz suggested during a speech on the first day of school last year that the additional alcohol sales could help address WSU’s $13 million athletic department revenue shortfall, with sales predicted to total as much as $1 million. In November, a liquor and cannabis board spokesman said the university had not yet responded to a list of questions about the request, including how the school would mitigate security concerns. “It was a precedent-setting move, and the board had some questions about it,” board spokesman Brian Smith said. Rather than address the questions at that time, Smith said, university officials chose to study the matter further. Currently, alcohol sales are allowed at designated areas outside the stadium before games and during halftime. In the stadium, alcohol is served to those with club seats and in suites. The university will likely not decide whether to resubmit the request for additional sales until the end of the academic year, said WSU Vice President for Marketing and Communications Phil Weiler. “We’re sort of taking a step back and we’re reviewing our application,” Weiler said. University officials are viewing the request as a university-wide issue, he said. Allowing additional alcohol sales would be a precedent-setting move for other universities in the state, he said, in addition to affecting WSU football fans and the Pullman community. “We’ve got a pretty broad group of folks at the vice presidential level taking a look at this, trying to decide if this is the right move or not,” Weiler said. Out of about a dozen comments submitted by Washington residents to the liquor and cannabis board about the proposal at that time, all but one were opposed. The writers expressed concerns similar to the board’s, as well as worries about a potential increase in incidents of on-campus violence and drunken driving after games. Weiler said those concerns will be part of the conversation over the coming months as university representatives decide whether to make the request again. “I think what we want to be able to do is step back and really look at the consequences of any action we might take,” he said. Published: Aug. 30, 2017, 9:12 a.m.